Eric Zimmerman is a veteran game designer with more than 25 years of industry experience. For nine years, he was a co-founder with Peter Lee of the award-winning studio Gamelab, which helped invent casual games with hit titles like Diner Dash, as well as make innovative games like Gamestar Mechanic, an online community that lets players create games. Pre-Gamelab titles include the PC title Gearheads and the indie pioneer SiSSYFiGHT 2000. 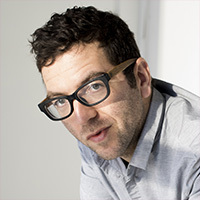 In recent years, Eric has created game installations with architect Nathalie Pozzi for museums including the Museum of Modern Art in New York City and the Smithsonian American Art Museum in Washington, DC. He designs tabletop games like the card game Metagame (with Local No. 12) and the strategy boardgame Quantum. Eric is the co-author of Rules of Play and the Game Design Reader and co-founded The Institute of Play, a nonprofit that opened a school in NYC based on games and play as the model for learning. He is an Arts Professor at the NYU Game Center.